ChrisTV PVR (Personal Video Recorder) brings TV on your PC with high quality image and sound. The software is designed to control analog TV Cards, Graphic Cards with Video Input (VIVO),Webcams, TV Cards with MPEG hardware encoder: Hauppauge PVR series, Leadtek PVR2000, ATI Ehome wonder and works with many video capture devices. Features include: Multituner support, TimeShifting, support for Windows Vista, AVI and MPEG2 recording, advanced recording settings, advanced scheduler, recording profiles, radio FM support, channel autoscan with fine tuning, support for DScaler deinterlace filter and FFDShow filter. With the trial edition, recordings from TitanTV listings limit themselves to 45 minutes. 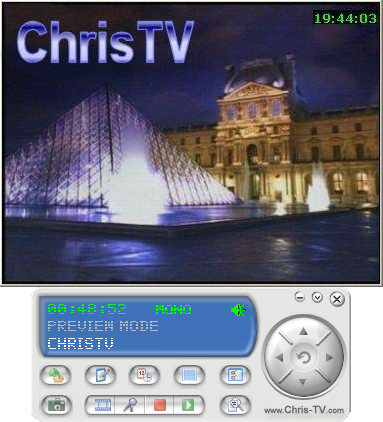 ChrisTV Professional is the top class product of this suite, including all the available features of the ChrisTV product series. Enjoy this professional PVR (Personal Video Recorder) application to watch, schedule and record analog TV & Radio FM programs. Avoid. Installs all kinds of crapware in the background without warning. yes i know they warn you its supported by bundleware, but not the nice type you can easily opt out (as it seems to install things in the background and my antivirus went basaltic!!!). On the main issue is that very very few of the channels actually work. If You want to listen radio, Then it is best to choose it. Because it provides the many programs of radio. skip past all these adz. 1./ RelevantKnowleged - Decline - go next. 2./ Delta toolbar - Advance - Untick Box - Untick Box- Untick Box - Go next. 3./ Confirmation - Press cancel. 4./ Special offer 1 - Press Skip. 5./ Special offer 2 - Press Skip. 6./ Special offer 3 - Press Skip. 7./ Special offer 4 - Press Skip. 8./Install Complitly - Untick Box. I paid for this software, you still have to download the pro version from here or elsewhere. Once you buy it, You get sent a link to a unlock app. I don't see why Chris, could not host a free add version for he's paid customers on his own site. After all it cost £24 I'dd expect for this. Plugins - You need some for this. And why not integrate these into Chris Tv (Chris? Get these to download for watching streams. (Chris) You have a good Internet Tv software, You really could Implement a few extras (Given sometime) Integrate the above plugins to your program. Add a few more favorites list, then just one. Four would be even better. Recording of video in pro, Add some over free plugins to record in over formats dude. Add a rate list and reply box, if stream is broken. Then i give you 5 Stars' if you can improve on a good few request of mine. I think this is a handy tool with a cool interface, better that a lot of others free ones I've seen. You can watch online channels over the Internet among them also some premium channels. Sometimes they don't work, I suppose because URLs/servers are changing, but they ussually update them fast. So for me it works, I can record my favorite shows from UK channels and also I watch movies. Overall I can say it's a good software and if you like JTV or Veetle you will have fun. I found it to be a piece of sh!t software. I highly recommend to stay away from this garbage software. My anti-virus blocked two toolbars during install (Adware.Win32.RelevantKnowledge.a (v)). WinPatrol also alerted me to the fact that it was modifying internet explorer. Most of the TV channels didn't work. And when I uninstalled it with Revo Uninstaller Pro, it messed my settings in Palemoon right up to the point that everything was the default. I'm using it everyday to watch channels from UK and France, some Veetle movie channels. Really nice software. Avoid this. My antivirus went like crazy during installation. All available for nowt, nothing, nil, nought, free. Christ von line! That's like paying the preacher in church, lol... 3 stars for the babe in the screenshot.